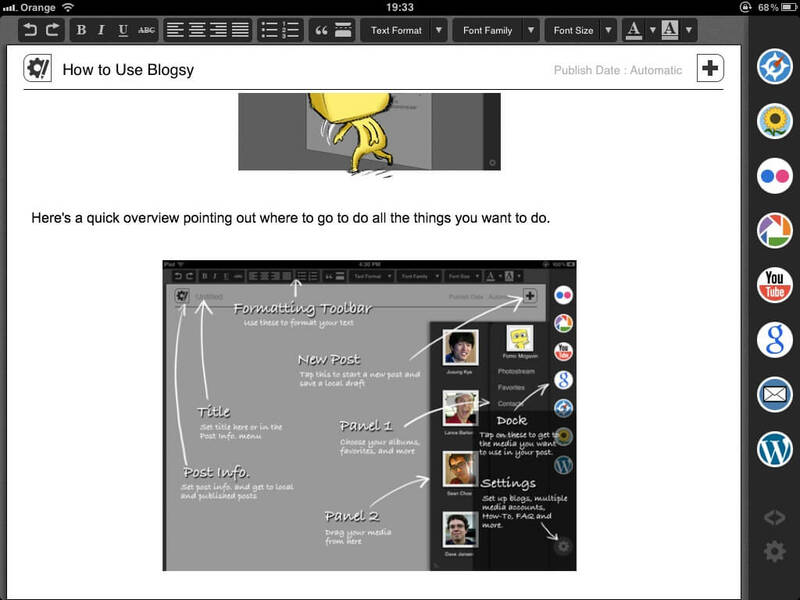 Following a recommendation I’ve just downloaded the ‘Blogsy’ app for iPad. As you’ll see from the screenshot, there are lots of built in formatting features, which if you’re a Posterous or Blogger user makes it super handy. It makes it super easy too to add in different media with the social media tie ins you can see on the side bar. Flickr, Picasa, YouTube, Google and Safari are all supported. It also supports multiple blog formats too, so whether you’re WordPress, Joomla, Drupal or pretty much whatever; Blogsy is a one stop shop blogging platform for all your needs. Tidy! I don’t use edublogs, however as edublogs is based upon a WordPress platform I would assume that yes, it would work. Certainly worth a try I think. As a mobile blogging tool, it’s feature rich and I really like it. Thanks for the comment and for checking out. Yes, Blogsy will work with Edublogs. You will set it up as a hosted wordpress.com blog. You will then be able to add images from your camera roll as well as youtube videos or any other video or item you can get an embed code for. Thank you Kristin – that’s really helpful!